Mischief Theatre presents Groan Ups, tickets available now! MIschief Theatre are back in the West End with a new show for the first time since 2016. Groan Ups tickets are now available for the debut of the Mischief Theatre Company's new residency at the Vaudeville Theatre. 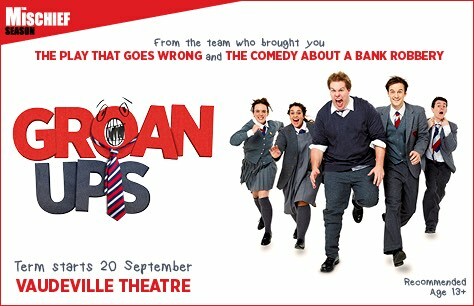 Groan Ups is the latest offering from the company that brought you the smashing West End hits The Play That Goes Wrong, The Comedy About a Bank Robbery, and Peter Pan Goes Wrong. This social comedy takes us from the classroom to the adult world and asks whether we really change from 13 to 30. How much does our school experience really shape our future? Is it possible to leave a schoolyard crush behind us, or does it grow up with us? The original cast of the Mischief Theatre Company are back in school, and in the West End. Watch as the company play a disorderly group of kids, the rebellious teens they become and the adults who return to a school reunion to see whether any of them have really changed all that much. The Mischief Theatre Company was started a decade ago by a group of LAMDA students. It's fitting that they are now returning to the classroom with their newest show, Groan Ups. The young company started to make a splash in the theatre world very quickly and soon had multiple West End shows running. For three consecutive years, their new shows were nominated for the Olivier Award for best new comedy and The Play That Goes Wrong came away with its award. The show continues to play to delighted West End audiences and currently has a UK tour. In addition to thrilling audiences in London, Mischief Theatre Company shows have been staged in cities around the world and have met with international acclaim. In addition to their stage work, the Mischief Theatre Company have also had two BBC One specials- an adaption of Peter Pan Goes Wrong and a broadcast of A Christmas Carol Goes Wrong which was watched by more than 4.5 million viewers. Groan Ups is made up of members of the Mischief Theatre Company. The entire cast have performed in The Play That Goes Wrong, The Comedy About a Bank Robbery and Peter Pan Goes Wrong. Henry Shields, Henry Lewis and Jonathan Sayer are the Olivier award-winning co-writers of The Play That Goes Wrong and will be appearing in their new comedy creation. The cast also includes Bryony Corrigan (Holby City, Downton Abbey), Dave Hearn, Charlie Russell (Doctors, And Then There Were None), and Nancy Zamit (Frankie and Emma, Welcome to Neverland, Stupid). In addition to their work with Mischief Theatre Company, Lewis and Sayer have both taught at LAMDA, with Sayer also teaching at Mountview and CSVPA. Lewis also won the Mark Marvin Prize for his work on Superior Donuts at the Southwark Playhouse. The Mischief Theatre Company are known for bringing wildly imaginative and laugh-out-loud funny productions to life. They have certainly made a name for themselves both in the West End and abroad. Don't be tardy to the party, make sure you're among the first enroled to see Groan Ups. Groan Ups tickets are sure to sell out, and this is one class you don't want to skip. Book your tickets to Groan Ups now to guarantee the best seats at the best prices!